Greenland was the hardest part of the trip and tested us all daily it seems. 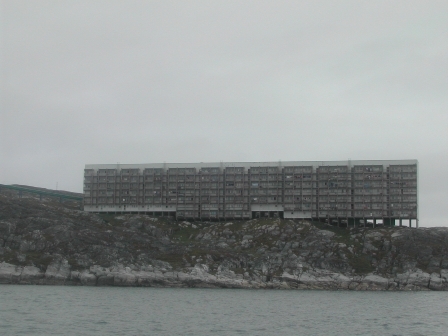 We spent far too long in Nuuk and, like many people familiar with the place, came to dislike it. 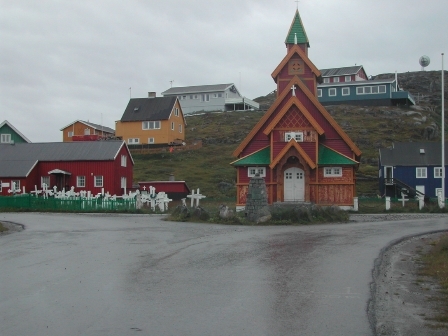 Not at all like Greenland seems to be the common consensus, more like any other European city. Well, not sure about that but it had its share of ugly buildings, trendy dudes and modern shops. Finally we were ready and headed off in the company of a Swiss boat in the direction of Disko Bay. This is an area all cruisers head for as the ice bergs are enormous, many weighing several million tons, the area seems to have its micro climate and you get to sail your boat inside the Arctic Circle. As we left Nuuk on a fickle wind a couple of humpback whales decided to entertain whoever was out there and 3 boats could be seen drifting in circles as the whales sported themselves about. They grew tired of us after 40 minutes or so and drifted off as we did. Once we cleared the long entrance we found the wind had settled but from the North which was where we needed to go. The Swiss boat simply powered away whilst we continued a slow, very slow beat north. We spotted a south going boat and chatted to them on the VHF. They were travelling with a Danish boat we’d met in Baddeck and from Kim and Kirsty we got the news that the weather was likely to remain north for some days. We pondered. Disko was about 350 miles north. 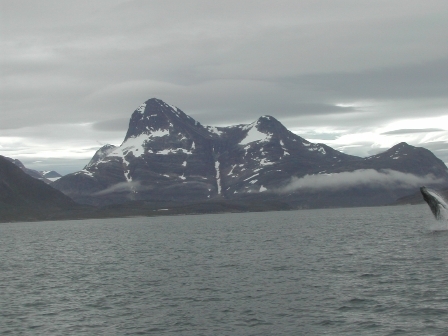 The two boats we had spoken to had been up there (loved it, best place they had seen, you can’t come to Greenland and not go there etc) but had been waiting a week for a northerly wind to get back. 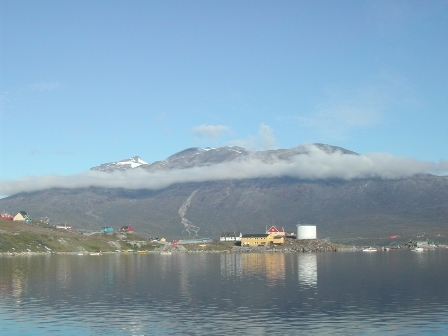 From Nuuk to the southern tip of Greenland was about 500 miles and with time running out we reluctantly decided that we no longer had the time to get that far north and that we would spend a bit of time exploring the fjords around Nuuk. 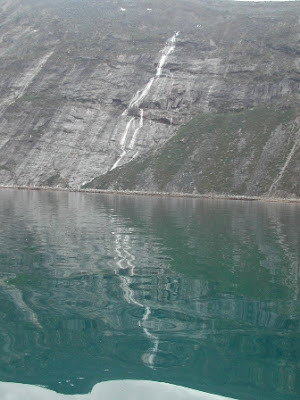 So we turned and headed back in and from there began a few manic days of cruising the fjords. We motored much of the time, visited remote communities and spent a couple of days dodging ice bergs and growlers that had broken off a nearby glacier. At times it looked as though we wouldn’t find a way through and each of us would stand on the main boom looking for a gap. 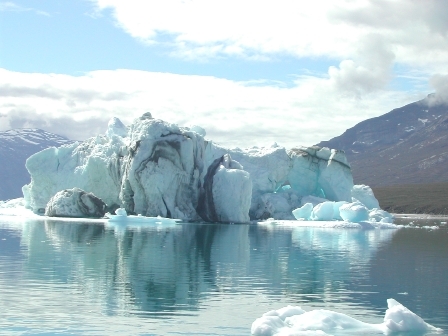 It is an amazing sight, with huge cliffs, blue sky and a sea littered with ice of varying shapes, sizes and colours. After 8 or 9 hours the ice began to thin out and we made better progress. 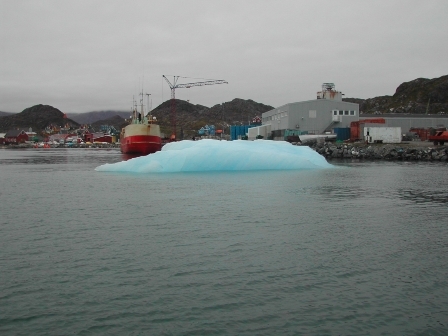 Off to port and about 25 yards away ice about the size of a small house suddenly began to roll. They make a noise before they do; I guess the sound of the ice dropping off underneath or something. It is sometimes spectacular but always graceful as they roll and then bob up and down. It’s the bit that drops off that causes the problems as it, released from its parent, hurtles through the water like a rampaging torpedo. They have been known to sink ships and this piece appeared in the water immediately in front of Hannah bringing us up in heap as we rode up on top of it. The force damaged the bobstay stem fitting, twisting the bolts and cracking the epoxy on the stem. At speeds below 5 knots no water came in but anything above that forced a trickle through the bolt holes. Equally I may not have been paying enough attention to the path ahead but I swear it was ice free moments before..... Back to Nuuk for more repairs which we carried out by dragging as much weight aft to elevate the bow, removing the fitting, drying out the holes as much as we could and then injecting Sika Flex into, onto and everywhere in between. A makeshift repair if ever we saw one and made worse by the fact that the Sika Flex was white not black. Ah well perhaps no one would notice. 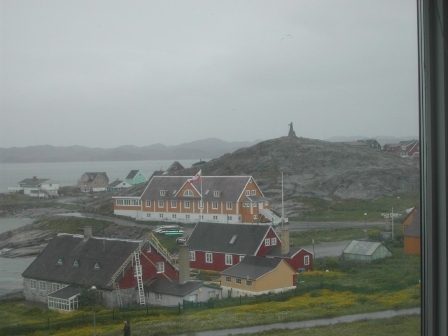 A day or so later we headed out of Nuuk and headed south and the start of the homeward journey. Incredible sky, huge ice covered mountains and a breeze promised a great start and we made our first anchorage in good time. The site of an abandoned Faroese settlement it was deserted, quiet and peaceful and exactly what we needed. Moving south we came into the little town of Paamiut, no roads in or out, helicopter or boat only. Didn’t stop the local Danes having vehicles to drive the 3k of road the town boasted. The pilot book is a bit dismissive of the place but we liked it and everyone was friendly. As we arrived a crowd gathered to watch us and a man indicated where we should lie which is how we met Sunni, a Faroese skipper who entertained us and set us right on icebergs. (We told him the tale of hitting one. He looked horrified and asked how far away from it we were. On hearing the distance he asked how big was it and then relaxed, lent over and said “that’s an ice cube not an ice berg”.... 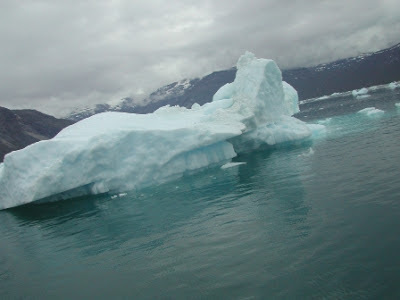 The harbour itself had several “ice cubes” floating around inside it and one could have easily crushed us. The locals are blasé about them and will drag them out of the entrance should anyone be in danger but a little worrying to us. Sunni showed us round his ship having visited Hannah and we couldn’t believe the 3 chart plotters he had. His boss came down to see us a day later and remarked that Sunni had been horrified/impressed with our seeming lack of navigation gear. We left after a few days only to return hours later as we noticed the rigging on the mizzen had slipped and we needed a ladder to reach it. The forecast was favourable the next day and we headed out with a promise of NW winds intending to get down to Julianhaab, rest up and leave from there with a good forecast for the trip home. Hours later the forecast came in on Navtex to warn of a wind switch to SE 8 with worse to come. The whole coast between us and Cape Farewell, the southern tip, was nothing but gales or storms with wind speed of 25 metres per second or getting on for 60mph. 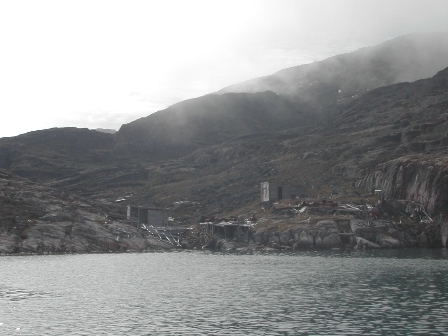 (A week later I realised I was grateful when the forecast indicated that the wind was easing to Force 8 and thought “this is a dumb place to be sailing”....) Weather forecasting in Greenland is extremely difficult and winds are likely to be reversed making passage planning difficult. Our situation was made more difficult by a lack of charts for some areas forcing us to stay off shore rather than take the inside route and so day after day we faced SE gales, the very direction we needed to go. We were being pushed SW, away from the coast where the current runs north and brings with it ice from the east coast. Safer but not the direction we wanted to go but we seemed to have little alternative. Heading back to Paamiut was no longer possible and we debated whether to head over toward Labrador and trying to pick up the south going current. In the end the wind went easterly allowing a slightly better course so we carried on as before. Now, with the memories behind us, the sequence of all that happened is a little vague. We took 11 days to clear Cape Farewell, a distance of less than 500 miles. At some point after that the winds became SW and favourable, and all though we were forced to heave to on several nights as gales became storms and we felt it too dangerous to continue, we made progress and one night were running under reefed main only before a big sea. All was well on Hannah as Bee, sat at the nav. table with Toots on her lap, reading and I dozed on the berth by the unlit fire. A rogue sea came over the stern, poured through the hatch and dumped who knows how much water below. Toots was swept off Bee’s knee, through the cabin ending up by our berth utterly soaked, electrics and food were drowned and we spent several hours bailing out and trying to restore order during the course of which we discovered we had lost not only the Yeoman plotter but also our SSB, calculator and alarm clock. The SSB meant no weather as Navtex doesn’t work offshore but having no alarm meant watch changes were haphazard if the other person was steering. That sea was the worst but others snuck aboard and would pour through the slightest gap to the extent we needed to battened as much down as possible. Unfortunately as the gales and storms carried on Hannah grew wetter as lack of ventilation added to wet oilies and clothes took their toll. We had sewn together a very rough spray hood in Belfast and beefed it up with additional pieces of canvas and then rigged up a framework from a boarding ladder, fish bin and the rudder from our dinghy. It worked surprisingly well except that climbing in and out of the companionway became a lesson in lateral limbo dancing and because the fish bin was weighted down with sodden clothes every entrance meant leaning well into said pile and breathing the aroma.... Lovely! The boat began to smell (like a midden or as if we were permanently sited in a stable with a dozen incontinent horses.....) and the day we had a weather break saw Hannah festooned with gear as we tried to make life bearable. 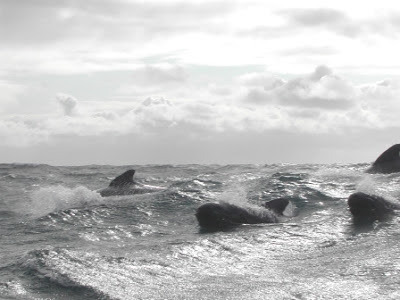 The next day saw us battling the weather once again and so it went on as we slowly made our way toward the Channel. Once we got below 54°N life began to improve. The wind and sea felt warmer, the miles to go began to reduce and we felt we had been tested and had all come through it. We do remember one night as Hannah under two reefs, sheeted stays’l and the self steerer in full operation roared down the path of the moon. A bit of a sea was running but we were out there absolutely on our own and it was a joy to stand on deck watching the movement of the boat as she rose and fell. A wonderful memory. Actually I found myself marvelling at that movement even in the most savage of weather as wave after wave went rolling under our keel and Hannah rose to each one. Wish that they had all behaved in such a fashion. Whenever we changed the stays’l for the storm jib which meant working on the foredeck, one of us would inevitably disappear under a huge lump of spray as the rogues took their opportunity to climb aboard. The storm jib became one our favourite sails as we could set either flying on the bowsprit or inboard in place of the stays’l. It’s a very small sail and can be hoisted in almost any strength of wind although the night it blew from hell we realised it would be futile if not dangerous. The main suffered and seemed to tear at the most inappropriate times and one night we were forced to remove the sail, take it below and sew yet another patch on it as conditions outside would have made the job difficult. At least below we could hear the whales singing to each other. In between sail repairs we were busy with plasticine, useful for stopping leaks or tightening up the self steerer which got battered every time we heaved to or lay a hull. In the end we used a Spanish windless either side and cranked it up hard to stop any play. 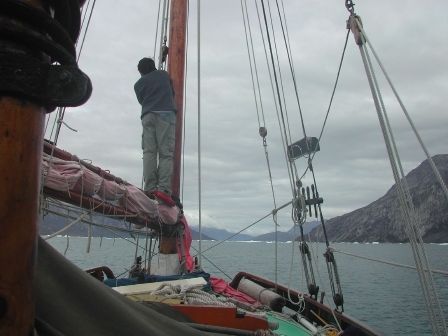 Usually we would run the engine once a day to keep the batteries topped up and had had no starting problems since Nuuk. For whatever reason we missed one day and the following day not a peep could be heard from the thing. Over the next few days or more be moved the instrument panel, took the starter and solenoid off (several times) replaced the solenoid, checked every electrical connection and replaced any that looked in the slightest bit iffy and still not a sound. As this had happened about 700 miles west of Ireland our only concern was getting the batteries to last until we got back which, at that stage, we felt was at least a week away. We switched everything off, used the GPS 4 times a day to get a position and used a solar powered garden light as a compass light. Kero lamps gave us light inside but we didn’t use nav lights as we were still too far out, a practice neither of us felt comfortable with. Slowly, slowly we got closer. Staying well clear of the Irish coast we crept toward the Scillies and at the entrance to the channel the wind died. We drifted around the edge of the shipping lane, narrowly avoided a collision with a fishing boat and wrapping the appropriate coloured rags around our kero lamps burnt makeshift nav lights as we watched the lights over Newlyn twinkle. (We had checked our main nav lights after a particularly bad blow and as the Port light wasn’t shining I went forward to check. “There’s no light” I reported to the chief electrician “Oh the bulbs probably blown” she said, “No” says I “there isn’t a light there, its gone, fitting an’ all have been washed away” As these lights are secured to our main shrouds some 8 feet above the waterline............) Hours went by and we could still see Newlyn so called the coastguard to warn them we had no engine, little power and poor nav lights. “Did they” we wondered “know a vessel who could tow us into Falmouth?” We explained where we had come from; that we needed to clear customs, that we couldn’t come alongside as we had a cat etc etc. He’d see what he could do and around 9am called to let us know a vessel was on its way to us. YIPPEE............... Out of the mist loomed a ship. A very large ship, a coastguard tug with orders to tow us in (the guys who came over to look at the engine took one look at the space available to access it and making various excuses suggested we get it checked ashore) The hawser was probably 3” or 4” diameter but settled easily over the bitts and at a stately 4 or 5 knots we set off. But where? I called up the tug to find out to be told Newlyn.........they would drop us in the bay and we could anchor.........except the weather was meant to go NE which would leave us exposed..... all in all our yippee tow was turning out to be not quite what we needed. Remember we’d been at sea for 32 days and were concerned about complying with the law on boats returning from non EU countries and having an animal aboard. We explained, again, the predicament and the coastguard shrugged and said it wasn’t a problem...........aah if only we had listened. With the breeze picking up we felt we’d take our chances and head on for Cherbourg and asked them to terminate the tow which they did with remarkable good grace (we subsequently learnt that the tug costs £1000 per minute to operate!) We sailed slowly away and then watched the wind die, return and die time and again through out the day. We couldn’t believe it and as the evening drew on we were still off Newlyn and little chance of going anywhere. Humble pie time folks. Called the coastguard and asked them to call a couple of people and let them know we were alive. One of the calls was to friends we had made in the Caribbean who live in Helford and may know someone who could tow us in. The coastguard rang them and, off his own bat, a commercial company who agreed to come out to us. We negotiated over the radio but turned him down as the hourly rate of £130 meant we could be looking at £300+ for the 10 mile trip. The coastguard called us again to let us know a fishing boat was trying to speak to us and for £100 Steve, the skipper of Cesco towed us calmly and safely into Newlyn. What a great place Newlyn is. £6 a night to moor there with the 3rd night free, good facilities and we were home. The following day we rang Nigel and Jude, our Helford friends, to find they had got the CG message and had promptly driven to Falmouth, with a load of goodies, where we were expected to land to find we had gone else where. They ate the goodies and drove home. We rang John at the yard (he has been incredibly helpful in helping sort out all our mechanical and electrical problems) who listened to the garbled story I told and said “Where are you” Newlyn I replied and expressing delight that we were so close(?) said he’d be down to sort us out the following day. And he and Terri duly arrived the following day and in a short space of time had the engine running. Nige and Jude arrived, a bit of a party started and then John and Terri were on their way back to Southampton, a round trip of over 600 miles! We cast off at 06.30 and took the flooding tide up toward home. Part of the channel off Cowes is for very large ships and yachts are meant to stay well out of it but inattention and a light wind saw us on the leeward side of the channel as a large tanker came boring down on us, whistle going and making it clear he, rightly, wanted us out of his way. We bore away, rounded up and tried to get back against the tide. The speed of 1.3 knots dropped to .9 and then .6 and when we were overtaken by a nearby buoy I knew we were in trouble and we gybed round and headed down the Cowes side of the Brambles and over toward Portsmouth. Clearing the shallows we worked our way across and began the long haul back to Southampton. Luckily John and Terri had come out in their boat to tow us in or it would have been yet another night out waiting for a favourable tide. So some 7 weeks after we left Greenland we finally made it back to our friends at Quayside, familiar faces and boats, glad to see us home safely and find out how it was. 32 days at sea to complete a 1900 mile trip tells its own story really and the other 15,000 pale away by comparison. A few asides. The night of the storm where Bee and I lay on the cabin sole and hoped to survive was a point when we both felt we were done with long distance cruising. A point where we wanted nothing more than to stop and be done with the terror and fear that storms engender, to spend time with friends and to feel a little bit settled. I even promised I’d be down the local nursery buying window boxes and plants to surround Hannah with............However as we came up Southampton water I felt as though we should already be planning the next trip, that great as it is to be “home” home for us is wherever we are with Hannah. Which I guess is one of the strengths of the human mind. It was without a doubt the worst trip ever. Horrendous seas, winds in excess of, well who knows what? Low after low came scudding across from Labrador and no doubt we picked the tale end of at least one hurricane. Would we go again? I don’t think so but who can tell. Bee would like to get to Disko and perhaps when we have new sails; sorted out the engine, ventilation and bilge pumps I may also feel different. But it is a challenging area to sail and boat and crew need to be in top shape which Hannah really wasn’t. Because of the soaking we took, life below was unpleasant, wet and smelly-much like sailing was 40 years ago but hadn’t been for us. Normally Hannah is a dry boat (not in that way you fool) and we’re rarely troubled by seas coming aboard but sometimes we need these things to make us aware, to highlight areas of life that could be improved and so it is with us and ideas, thoughts and schemes abound for changes and improvements. On a positive note we have seen dozens of whales including a 40 strong pod of pilot whales that were surfing with us as we romped toward home one day. The calm weather didn’t interest them but a blow brought them out to play and they would keep station with us for hours. Oddly enough the whales excited no interest in Toots at all yet the moment the dolphins appeared she was on the capping rail watching. Has it all been worth it? Of course! We’ve met many wonderful people, had a great time and look forward to the next wander around. Arriving back, seeing familiar places and people is always warming and we have been touched by the interest people have had in what we have done and how pleased we are to see them and vice versa. We’re amazed at how friends have rallied, sorted things out for us, appreciate we need a little time to get ourselves mentally sorted out to the change yet extend offer after offer for small kindnesses that mean huge amounts to anyone coming from a sea journey. To everyone, many thanks for your kindness and support.